Environmentally friendly themed badge. 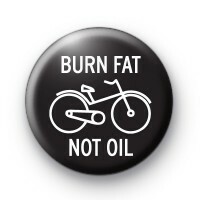 This black and white Eco badge has the slogan Burn Fat Not Oil and a bike in the centre. It is a reminder to the world that cycling is better for you and the environment, so why not stay healthy and save the planet by ditching the car and start cycling instead. This green themed badge is a must for any cyclists or cycling buffs or if you are trying to raise awareness for global warming and saving the planet. All our badges are 25mm in size and handmade by us.